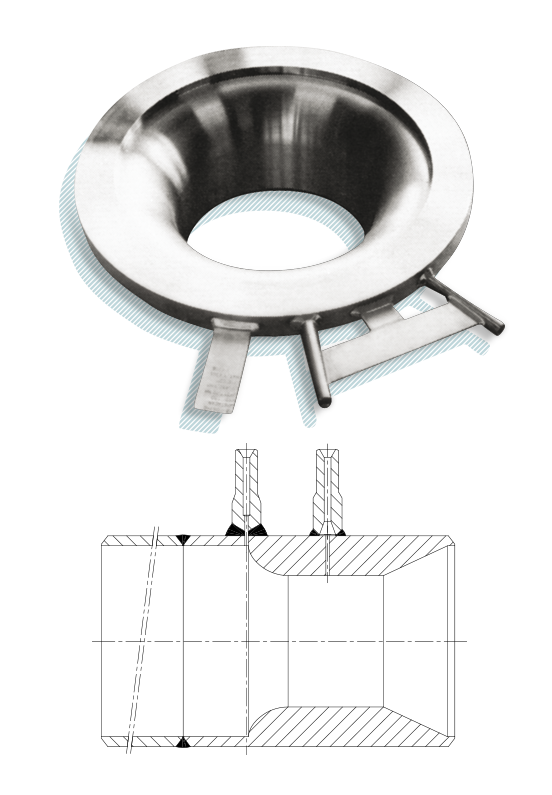 Long Radius Flow Nozzles and ISA 1932 Flow Nozzles are manufactured from forged bar and can be welded in the line or placed between two (orifice) flanges. In that case the Nozzles are supplied with a spacer ring and gaskets. It is also possible to deliver the Flow Nozzle as a pipe spool with flanged or buttweld ends. Venturi Nozzles are designed according to ISO 5167 or DIN 1952. The Venturi Nozzles are manufactured from forged bar for sizes up to 12” to guarantee maximum roundness. A combination of forged bar and rolled plate is used for larger sizes. All welds are always machined flush with the inside diameter of the pipe.